Sowerby Bridge were determined to put on a show in memory of club stalwart Dave Culpan, who died last week, and duly won 4-1 away to Calder ‘76 in the Premier Division of the Halifax AFL. In front of a good crowd, bolstered by Bridge second team players, the fourth-placed visitors struck twice in the opening 10 minutes.A deflection off Ben Oldfield gave Bridge their opener and when Damien Watkins headed a second following a good ball in, Calder looked in real trouble. However, the home side refused to buckle and had a goal of their own chalked off, from a Nathan Dempsey header, for a marginal offside. Calder kept it tight and defended well but suffered another blow two minutes into the second half when a cross hit Kieran Sim, seemingly leaving a muddy mark on his shoulder, and the referee awarded a penalty which Bridge converted. The home side took this setback in their stride. Oldfield was denied by a good save and Steve Jones had an effort cleared off the line before an Oldfield effort was deflected in for 1-3. When Bridge went down to 10 men Calder sensed an opening but Bridge got a fourth in bizarre circumstances when the home net rippled, the ball was cleared and play carried on. Home keeper Rick Davison was adamant that he had saved the effort but Kenworthy said his initial thought had been that it had been a goal and the referee had been well placed to award one. The fourth goal was the killer but home boss Rob Kenworthy said he had been “quite proud” of the way his players had taken the setbacks in their stride. Shelf United repeated an earlier cup win at Hebden Royd Red Star but cut it finer this time, the impressive Luke O’Brien’s second goal of the game with a couple of minutes left giving thema 3-2 win. Red Star had plenty of the play but some desperate defending by the visitors in goalmouth scrambles helped them come out on top. Star had top gun Lewis Cockroft making an earlier than expected return from a hamstring injury and he made it 1-1 before half time after Shelf had scored on the break. Shelf regained the lead, after plenty of goalmouth drama at their end, but Mark Bradbury eventually made it 2-2 in another scramble. However, man of the match O’Brien won it for the visitors when he beat the Star right back and scored from a tight angle. 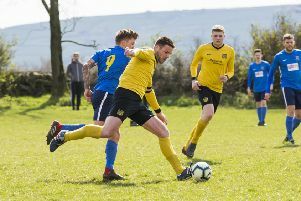 Northowram’s three match winning run came to an end as they shared four goals with Sowerby United at Northowram Rec. Scott Singleton beat the keeper to a bouncing long ball to put the Rams ahead after 12 minutes. However, the visitors, playing up the slope, were the better side in the first half and drew level within three minutes through Connor Ashworth’s header from a corner. Slack marking from a throw-in almost proved costly for the Rams but the visitors missed the clear chance and a vital block from the outstanding Archie Griffiths close to half-time kept the scores level. Singleton had a couple of chances, putting a header off target when unmarked and unable to get the ball from under his feet after taking it wide of the keeper. The Rams upped their game immediately after the restart and Singleton might have had a couple of goals while Ashworth’s overhead kick brought a good save from James Bunn. After 73 minutes Lewis Oldridge put the hosts ahead after he neatly turned his man. Sowerby were incensed to have a goal ruled out for offside but three minutes from the end more poor defending at a corner allowed Ashworth to bundle in his second goal. Midgley United are up to sixth after what manager Craig Gee termed a “smash and grab” first half away to bottom side Illingworth St Mary’s. Saints, yet to win in the Premier this season, had most of the play in the first half on the 3G pitch at Trinity Academy but turned round 3-0 down. Midgley then returned the compliment in the second half, yet conceded the only goal of the second 45 minutes. Joe Gibson got the first two goals from Greg Spink corners with a header and then a low shot from the edge of the box. Teenager Luke Horne got the third from close range at the back post. Midgley, who at least defended their area well in the first half, made changes at the break and George Bamford helped the visitors take a hold of midfield. There was also a good performance from Rob Stansfield up front. Saints hit the bar from distance in each half and broke their duck midway through the second period when Gareth Gaukroger got on the end of a through ball. Ryburn look to be setting out their stall for a strong title bid after recent near misses. They inflicted a 6-2 defeat on visitors Shelf FC to avenge last season’s Challenge Cup final defeat and go six points clear at the top. Alex O’Keefe got both goals for the visitors, who were losing for the first time in the top flight.